Peppermint mocha brownies are quick to whip up. They will be the perfect dessert recipe to bring along to that holiday party you decided to attend last minute. Raise your hand if you like thick and fudgy brownies with frosting. 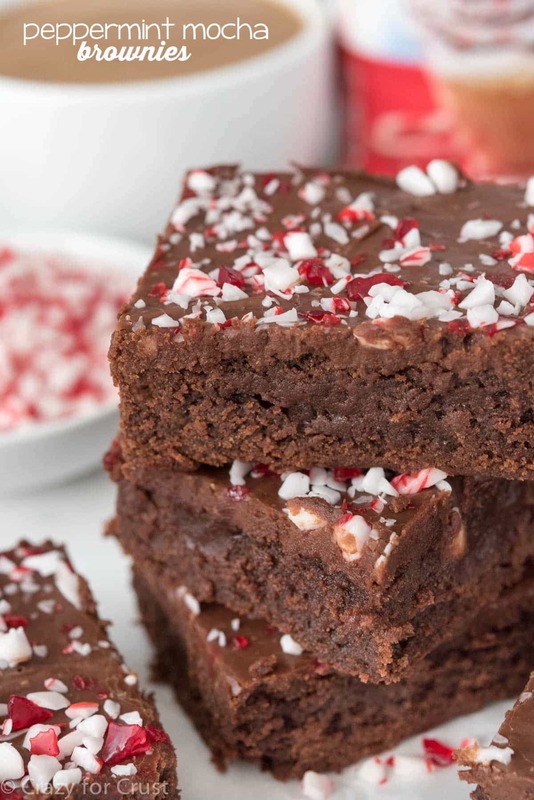 Then these Peppermint Mocha Brownies are for you! Instead, let’s talk about food blogger secrets. Want to hear some? Second, sometimes we food bloggers cheat. We make an amazing O-M-G this is insane brownie recipe and we top it with a rich peppermint chocolate ganache. And then we chill it, fingers crossed, hoping the ganache sets. And then it doesn’t. And then we cry because the brownies are so good and we don’t want to waste them. The solution? Some food bloggers might take the slab of brownies and hold it over the sink, scrape off alllllll the ganache, wash the top of the brownies with a damp paper towel, and then make a melted butter cocoa frosting instead. I’m not saying I’ve ever done that (*cough these brownies cough*) but…it’s been known to be done. And then, the third food blogger secret of the day? Using fun ingredients to flavor recipes and frostings. Although this shouldn’t be a secret because I do it ALL THE TIME. 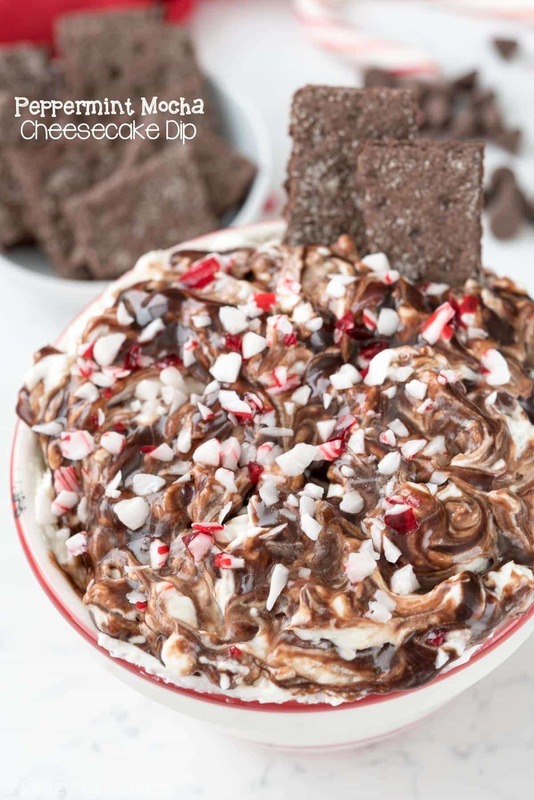 That’s right, you guessed it: these Peppermint Mocha Brownies get some of their peppermint mocha flavor from International Delight Coffee Creamer. The frosting is full of the good stuff! 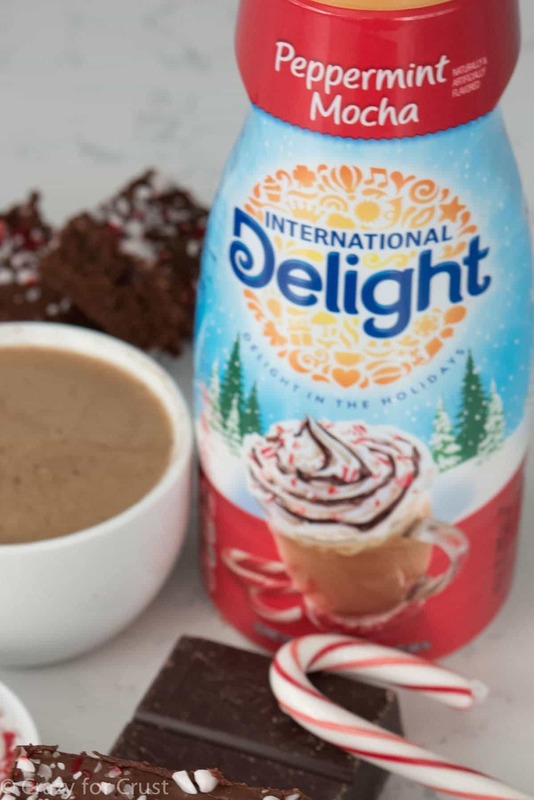 As I’ve been telling you every month for the last, I don’t know, trillion, coffee creamer is amazing in coffee…but you can use it in other fun creative ways too. Cheesecake dip, chocolate milk, cake, pie – the possiblities are endless. This time of year, I buy Peppermint Mocha coffee creamer in cases, that’s how much I love it. And it makes the best frosting! Let’s break down these brownies, shall we? First, these brownies are super thick and fudgy. They have 3 kinds of chocolate in them: semi-sweet and unsweetened baking chocolates and cocoa powder. There’s also tons of sugar, butter, and eggs which make the brownies the BEST ever. To pump up the chocolate flavor (and add some “mocha”) I added instant coffee granules to the brownie batter. I added them to the hot butter and chocolate mixture so it would dissolve a little before stirring in all the other ingredients. 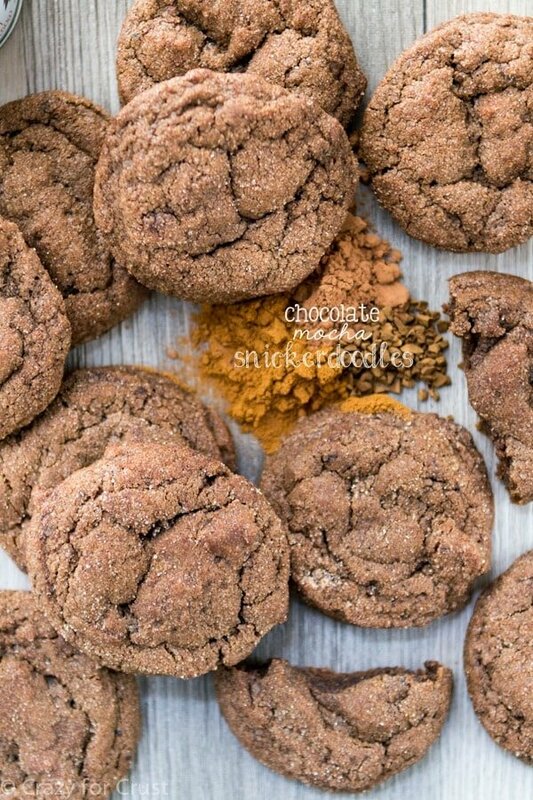 The recipe calls for 1 1/4 teaspoons, but if you have those instant coffee packets on hand, just use one of those. You don’t really taste the coffee flavor, but it really makes the chocolate taste more chocolatey. Omit it if you must, but really, don’t. 🙂 I also added some peppermint extract to the brownies, just to amp up that peppermint flavor. And then there is the frosting. Oh the frosting! The frosting on these brownies is similar to one you’d put on a sheet cake. It starts with melted butter and gets a hefty dose of cocoa, some powdered sugar, and Peppermint Mocha Creamer to thin it out and give the brownies that Peppermint Mocha flavor you expect from, well, Peppermint Mocha Brownies. 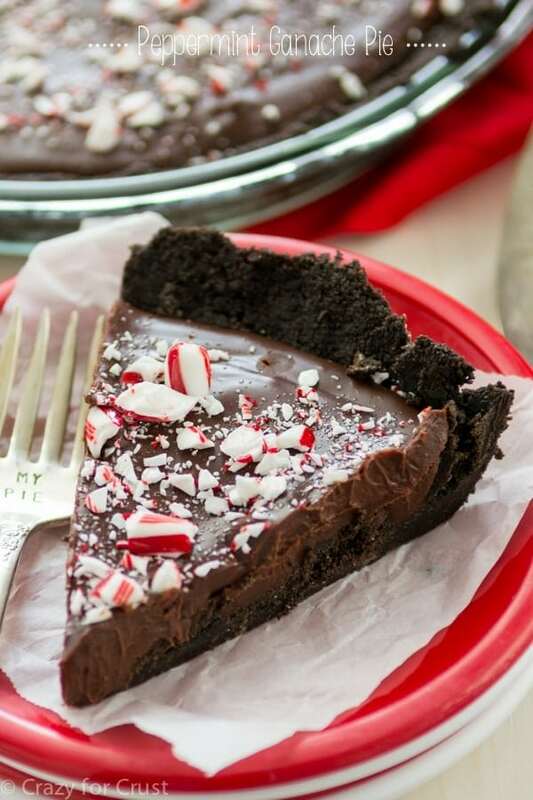 The best thing about this peppermint mocha brownies recipe is that it’s basically one bowl, a wooden spoon, and a big dose of chocolate and peppermint. And that screams Christmas…which is in two weeks. !!! 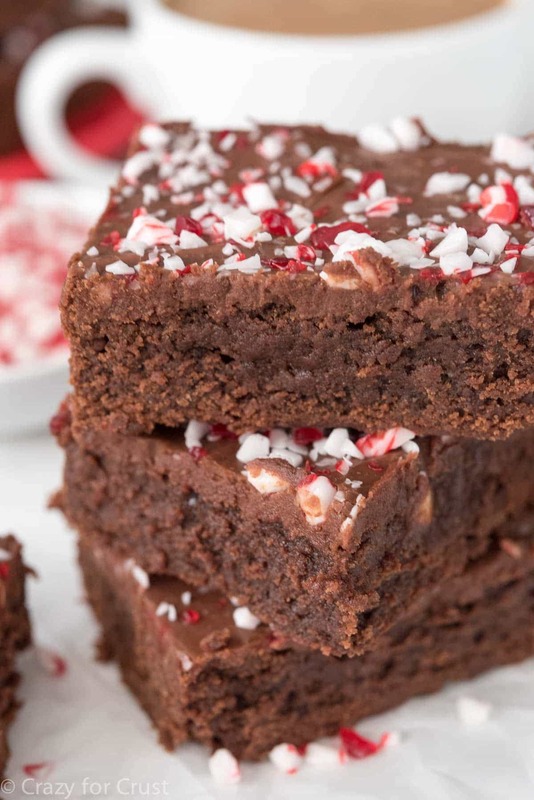 These thick and fudgy Peppermint Mocha Brownies are the perfect holiday recipe. The brownie is dense and rich and full of peppermint and mocha flavor, topped with a rich chocolate peppermint frosting. The perfect Christmas brownie! Place semi-sweet and unsweetened baking chocolate and butter in a large, microwave safe bowl. Heat for 1 minute, then stir. Heat additionally in 30 second increments, stirring well between each, until it’s melted and smooth. Stir in instant coffee. Stir in sugar, then eggs, one at a time, then stir in cocoa powder. Stir in extracts and salt, the slowly stir in flour. Spread in prepared pan. Bake for 25-30 minutes, until a toothpick inserted 1” from the edge comes out clean. Cool completely before frosting. Store in an airtight container for up to 3 days or freezer for up to one month. Find more inspiration in the International Delight newsletter on online on Facebook, Twitter, Pinterest, or Instagram. I get all my food blogging tips from you! Like resusing ice cream and cherries LOL. But the brownie trick is next level. And I have to say that I can see why you wouldn’t want these to go to waste! SO good! These look beyond amazing! I can’t to give them a try.